Chunks of fresh apple and pear cooked with a little water, lemon juice and cinnamon, until tender and then mashed and lightly sweetened with honey and/or maple syrup. I’ve been enjoying this delicious simple Pear-Apple Compote with honey and maple syrup all week and am already contemplating my next batch. The inspiration for this pear-apple compote comes from French Women for All Seasons: A Year of Secrets, Recipes and Pleasure (affiliate link) by Mireille Guiliano, author of French Women Don’t Get Fat: The Secret of Eating for Pleasure (affiliate link), one of the best “non-diet” books ever, as far as I’m concerned. With it’s emphasis on freshness, variety, balance and pleasure, the book has helped me learn to eat, drink and move more like a French woman while losing weight. It epitomizes the happy, healthy and slim life I aspire to. 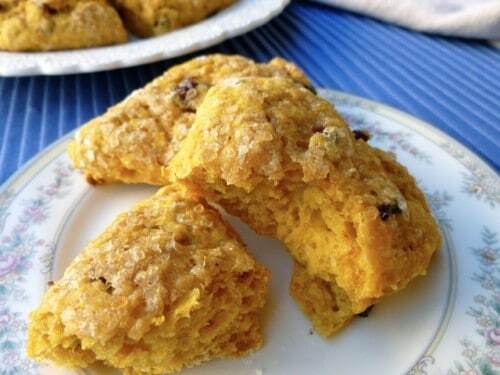 As soon as I saw the recipe, I knew it would be the perfect accompaniment for the low-fat cranberry pumpkin scones I had in mind last Sunday morning. I adapted the recipe only slightly – doubling it so there would be plenty around all week for breakfast, dessert or as a healthy snack – and adding a little maple syrup in addition to the honey. Because fruits and vegetables have 0 Weight Watchers SmartPoints, the SmartPoints in this recipe come from the honey and maple syrup. So to lower the SmartPoints even further, you can decrease the amounts, leave them out, or replace with your favorite sugar-free sweetener. According to my calculations, each generous 1/2 cup serving this pear apple compote has about 135 calories, *4 Weight Watchers PointsPlus, *3 SmartPoints and *2 WW Freestyle SmartPoints following the new program guidelines for 2018. And don’t forget to try different kinds of pears, apples, honey and/or maple syrup to change up the flavor. 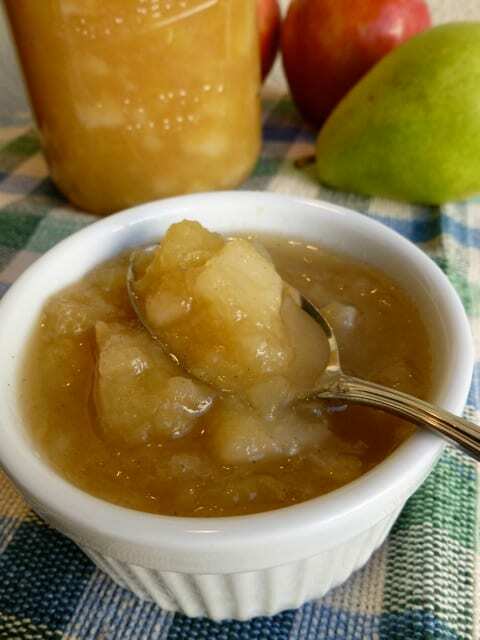 If you’ve made this pear apple compote, please give the recipe a star rating below and leave a comment letting me know how you liked it. 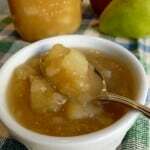 A simple pear and apple compote lightly sweetened with honey and/or maple syrup you can use a variety of ways. Peel, core and chop the apples and pears into 1/2-inch chunks. Place them in a medium-large saucepan. Add the water, lemon juice and cinnamon. Cover and cook over medium-low heat until tender, 15 to 20 minutes, stirring occasionally to prevent the fruit from sticking and/or burning. With a potato masher crush the fruit coarsely while continuing to cook until the excess water evaporates, about 5 minutes. Remove from the heat and gently stir in the honey and maple syrup. Taste and add more sweetener if desired. This sounds delicous .. will be making it this weekend. Thank you for all of your recipes and helping me on the journey. I have made many of your recipes .. they are wonderful. Love this recipe. A keeper.